YTL's YES 4G rates leaked! Somebody in the Twittersphere shared with us the leaked YES 4G price plan. There’s a picture that shows the rates that YES 4G is charging. 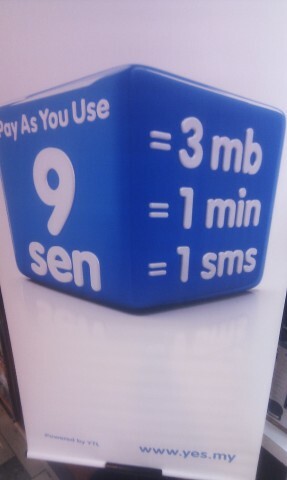 9 sen for 1 minute of talk-time, 1 SMS and 3MB of data. If this is the same rate for home use, then, we can kiss YES 4G goodbye! From this Pay as You Use pricing, 1 GB of 4G data is around RM30++. This is quite competitive, provided that the speed is as promised, 3 to 5 times faster than 3G. If not, then YTL 4G will not have the Unique Selling Point (USP) and will not dominate the mobile data industry. Hopefully, they will come out a different plan for home users. The call rate and SMS rate for YES 4G is very good but the information is quite vague. 9 sen for 1 minute call & 1 SMS is applicable to YES 4G networks or to other mobile networks too. This is very attractive and YTL did say in their website that they will not tie you down with plans or contracts. Let’s keep our fingers crossed and wait until the official launching of YTL 4G mobile internet with voice on this November 19th 2010 (Friday). ah john! Thanx for sharing this info..I’ve got my number chosen d for YES..how about you? No prob! YES! I had said YES to YTL’s YES 4G and registered my number dee. Hopefully YES will really make a lot Malaysian smile with YES, not NO with DISAPPOINTMENT! If that really happens, then YTL YES 4G commercial must change to NO and sour faces already. it’s unlikely that there’ll be different rates for home users. seems like its more for users on the go who doesn’t want to rely on wireless access points . the selling point is probably the speed and that the credits doesn’t expire. if the home rates are the same, it’ll impact the mobile industry(like Maxis, Digi, Celcom) more than it does TMNet Streamyx / Unifi . that’s really bad news for many of the broadband users. It seems that an angel is coming to rescue us from the devils of broadband but it’s also another devil in disguise!!! Ya. Many are quite worried about this. Is the 9 sen for mobile internet or home use? Let’s wait and see. Hopefully YTL’s YES 4G can solve our problems and meets our expectactions. Don’t let 4G becomes $G. now, it’s pretty obvious already. thanks for the help. 2 call centre all dead , call all the way no answer and ask you list down your number but never call back to you. 3 Go to “KL Centre” to ask for help they said its something problem with yes system , we will call you tonight or tomorrow for sure to explanations, few day no one call from them. 5 super waste time and super bad service. Don’t remove this, because this is a complaint, till you fixed the problem. agree! another devil! too bad to see that there is no unlimited package. Haha… There has been a lot of issues after the launching of YES 4G. Registration, customer service and support, access of devices, bad advertising tactics but speed is good as many had tried and there’s a free 10GB of data. Why do you say it’s leaked. It’s been openly sold by their agents for weeks already with printed brochures and all. I am facing the same problem with you. But I take it cause I was in MALAYSIA!!!!! Next story Blackberry Torch 9800!!! Torching Apples & Galaxies & the Ns & Motors!!! Previous story Update: Nikon D7000 Price In Malaysia!